Jurassic World 2 Director Set | Nerd Much? 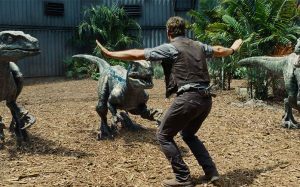 After a long search and numerous rumors, Universal Pictures has finally found its Jurassic World 2 director in J.A. Bayona, the man behind The Orphanage and The Impossible. The announcement was made via Twitter by Producer Frank Marshall and Jurassic World director Colin Trevorrow. Of course, the original Jurassic World was surprisingly well done and dominated at the box office, claiming the biggest domestic opening of all time by raking in $205 million. The cash cow went on to make $1.7 billion worldwide. Now that a director has been found, hopefully it means we’ll start seeing production find its stride so that we can get a steady stream of Jurassic World 2 updates, as there’s still a lot we don’t know about the upcoming sequel. For now, we basically only know that it won’t be titled Jurassic World 2 and that it is set to release on June 22, 2018. For more on the Jurassic World sequel, stay tuned to Nerd Much for updates. You can also follow us on Twitter and give us virtual high fives on Facebook to stay up to date with the latest.